GTI has established work placements links with a number of partner colleges in Europe including Finland, Italy, France, Portugal, Poland,Turkey, Spain and UK. These work placements offer our students a wonderful opportunity to develop their cultural and educational expertise while also completing a work placement in their vocational area. It is a unique learning experience for GTI learners and one they embrace fully as it allows them to develop skills and knowledge they may use in the future. Visit the Erasmus+ blog at:http://gtieurope2016.weebly.com/ and http://gtieurope2017.weebly.com/ and http://gtieurope2018.weebly.com/ for more information. 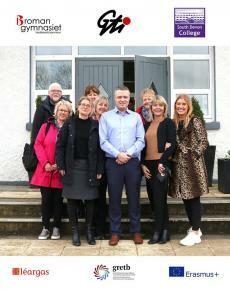 In early March, we welcomed visiting staff from South Devon College & Bromangymnasiet College in Sweden, who took part in Erasmus Professional Development at GTI. 31 GTI students are on Erasmus+ work placements during the month of April. IT Level 5/6: Poland (4 students) Film Level 5/6: Turkey (4 students ) Film Level 5/6: Finland (5 students ) Furniture Design: Finland (4 students ) Security Services/ Emergency Care Services / Beauty Therapy / Sports & Physical Therapy / Office Administration / IT / Business: (10 students). We also have 4 Nursing students on placement in Hudiksval (Sweden). 36 students were on Erasmus+ placements in February for three week placements. 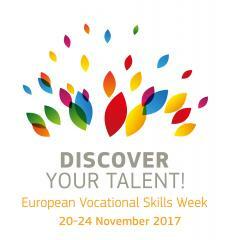 To celebrate European Vocational Skills week with the motto " Discover Your Talent", Galway Techncial Institute (GTI) are holding a celebration on Thursday November 8th to mark ten years of the college involvement in Erasmus work placements. #EUVocationalSkills #DiscoverYourTalent. 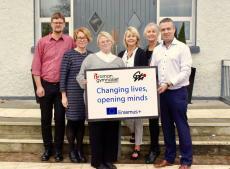 Galway Technical Institute (GTI), Coláiste Bhaile Chláir, and Coláiste na Coiribe are delighted to be part of The School Improvement Partnership Project (SIPP) 2017-2020 which is funded by European Commission Erasmus + programme of the European Union. The KA2 Strategic Partnerships for School Education is a project that allows the three GRETB schools to exchange best practice with other countries such as Finland, Spain and The Czech Republic. Erasmus + work placements: In May, 4 students from the Business Managment class were in Devon and 4 in Ceuta. There were 4 fashion students on placment in Grenoble, France. In April, 10 students were on placements in Tenerife: 4 from Health Science, 2 from Hairdressing and Beauty, 3 from Emergency Care Services and 1 from Security Services. There were 6 students from Information Technology Department in Poland, 5 from Nursing Studies in Sweden and 5 from Information Technology and Office Adminstration in Portugal. 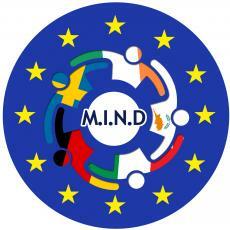 The STEM Engagement Europe Project (SEE Project) will be led by Zlinsky kraj and will involve a partner from the previous Careers of the Future Leonardo Partnership activity Galway Technical Institute from Ireland as well as a partner from a current TOI (Safe Arrival Project) SES13-19 Limited who have significant expertise in STEM (Science, Technology, Engineering and Maths) related work, a college from The Netherlands who participated in a STEM study visit in the UK and Cappadocia Education Academy Association who is well experienced in European educational projects. Current GTI students #EUVocationalSkills had an information talk on November 23rd from past students who completed an Erasmus+ placement during the last few years. GTI Business, Art and Media graduates shared their Erasmus+ experience of working in France, Finland and Turkey. Sports students from GTI are on Erasmus+ work placments in Glasgow and visited Glasgow Rangers Club. Four teachers visited Galway Techncial Institute in October 2017. They toured the Applied Health Sciences departments in the college. Picture shows Geraldine Gibbons, Principal GTI and John McLoughlin, Deputy Principal welcoming the Swedish visitors from Bromangymnasiet in Hudiksvall for their study visit. This KA2 Partnerships focuses on strategies for digital education at schools. The project tasks include primary research & secondary research. - pilots of schools digitisations. The ever increasing flow of migrants and refugees requires prompt answers on the part of all political, social and educational agencies to help them integrate in the new countries and become familiar with new social patterns. This big challenge for schools and educators has motivated the schools participating in this project to seek out a partnership to address issues around social cohesion, and integration of refugees and migrants.